So it may not turn dismal Northamptonshire into the Cote D'Azur at the height of summer, but this week's Five Grand Friday - the Mazda MX-5 - is a car that's guaranteed to at least cheer you up a little bit. 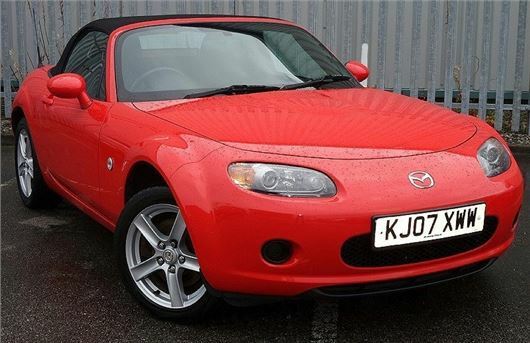 Fun, perky and compact in size, if the MX-5 was a 90s TV presenter it would be Gail Porter. Only without its rear end on the Houses of Parliament. Like Gail in her heyday, the MX-5 is good looking. Mazda stayed true to the MX-5 formula, keeping it small in size, light in weight and with the trademark rounded shape. The clean and unfussy design may be ten years old but it's ageing very well and when finished in red paintwork - as this example is - there's a lovely simplicity to the MX-5. There are no superfluous wings, vents or strips of chrome here. The car we found in the classifieds is a 2007 model with a smidge under 55,000 miles on the clock - that's below average for a car that's almost nine years old, although about what you'd expect for an MX-5. Few people buy these for pounding up and down the motorway. What the MX-5 is all about is enjoyment. It's a car in the mould of the MG Midget, designed around the driver with the focus on handling and agility. This car is the entry-level 1.8-litre version - there are no turbochargers here so the normally aspirated engine produces just 126PS. That doesn't sound particularly impressive. Indeed acceleration from 0-62mph takes a rather leisurely 9.4 seconds - a BMW 118i is quicker - but few cars can match the MX-5 in the corners. It's beautifully balanced with a real agility that makes tackling a series of tight twists incredibly rewarding. This generation of the MX-5 was also available with a 2.0-litre engine with 160PS. But don't think the 1.8i is the poor relation. In fact, in everyday driving you probably won't notice too much difference between the two. Plus it has the sporty looking twin exhaust pipes so you'll still look the part. Being a standard specification model, this MX-5 doesn't have too many extras. There are no leather seats although it does have the basics such as air con, a leather steering wheel, a good CD stereo and heated door mirrors. It has had four previous owners but that shouldn't put you off as it looks like a well cared for car. Things to check? Well there's the obvious like stone chips on the front, a problem for any low down sports car. Apparently this generation of Mazda MX-5 has very little rustproofing, so check carefully when buying. Plus of course check the hood fits properly. The MX-5 has a manual rather than electric roof to keep the weight and cost down. As a used buy it means one less thing to go wrong and have to worry about. On the whole, the MX-5 is proving reliable but the variable valve timing gear and timing chain can be prone to failure in as little as four years despite frequent oil services. It's a £1000 job to repair. And if you hear a grinding noise from the front brakes, it may be worn calliper pins and bolts. They cost about £125 to replace but fortunately the car may not need new discs and pads. As an honest and back-to-basics sports car, you simply can't beat the MX-5. This is after all the best selling sports car of all time. And don't think we mean 'back-to-basics' in a derogatory way, rather we appreciate the way the MX-5 focusses on the basics that make a sports car enjoyable - neat handling, a balanced chassis and most of all - fun.